Taste the very essence of paradise, sailing aboard your own private catamaran, watching for whales (in season), dolphins, manta rays and sea turtles from the spacious front trampoline, sipping on a cold beer, soaking up the warm tropical sunshine. Watch the jungle-draped hillsides of Puerto Vallarta glide past on your way to remote villages accessible only by boat. Snorkel with tropical fish or watch the sun set over Banderas Bay and the Pacific Ocean beyond. All of this can be yours for a day. This French-designed 38' Sailing Catamaran features a clean and comfortable cabin, a spacious deck, and a wonderful front trampoline that is perfect for feeling and hearing the water break underneath. There is a rear dinette table and also interior seating, with 2 restrooms available onboard. Your English-speaking crew will be waiting on you throughout the day, letting you just relax and enjoy the experience. Fully equipped will all the perks, from a surround sound system to hammocks and flat-screen tv, this lovely catamaran makes an affordable option for smaller groups of 20 people or less to enjoy beach hopping, sunset cruises, snorkeling trips and sailing trips. 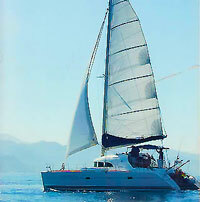 A truly memorable private catamaran charter in Puerto Vallarta.